With all the buzz about Dynamics 365 and cloud ERP it can be hard for some to imagine any company wanting to stick with older versions of AX–not for Clients First. With a history of working with this business solution from version Axapta 1.0 in 1998 to now, we know there are still benefits to staying on your current version that the new comer cloud just can’t beat. Our long history with AX gives you the experienced consulting needed to feel confident with the continued development and support of the older AX version. If your business needs support and/or development in using Axapta, Dynamics AX or Dynamics 365 for Operations our team offers technical mentoring, development, help desk support, training and a project plan for an upgrade when you are ready to make the move. From Axapta to AX 2012, we’ve done it all and can share our expertise with your business. Contact our experienced team - no complex, costly on-boarding! Yes, Clients First can support this version and even develop custom enhancements or mobile applications. Microsoft extended support ended for Axapta 4.0 on 10/11/16. Clients First supports several customers utilizing AX 2009 which include custom development. This release has Microsoft extended support until 10/12/21. Clients First has many customers utilizing this release up to Release 3 and the latest updates which has 2016/2017 (CU12) features and functions for on premise installations. With the updated features, Microsoft really could have renamed the recent releases to Dynamics AX 2016 or Dynamics AX 2017. Clients First is still actively installing and supporting this release. Extended support by Microsoft for this release has been set to end 1/10/23, however historically these dates are usually extended further down the line. This is the cloud/SaaS version of AX was released 11/1/16 a hybrid version available if you want more privacy and security. 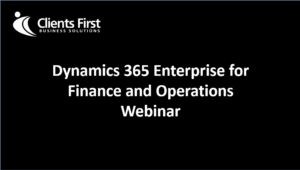 Clients First supports Microsoft Dynamics 365 for Operations or the Enterprise cloud version of Dynamics AX. We are in the process of writing the applications we have for AX 2012 (above) for Dynamics 365 for Operations. We can also customize applications based on your company’s needs. We have a long history of very successful AX development. Regardless of what version your business is using: AX / Axapta / Dynamics AX (DAX); Clients First is a partner with experience in supporting and developing for Axapta 1.0 release in 1998, Axapta 3.0 / 4.0., Dynamics AX 2009, 2012, and now Dynamics 365 Enterprise for Operations.